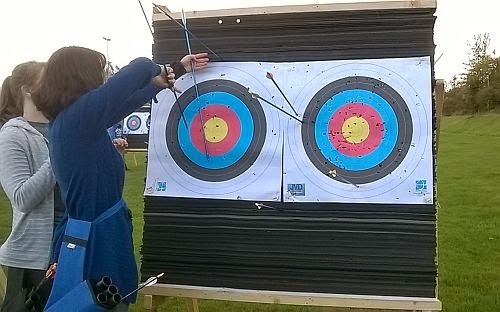 When Nicola, a friend from work invited me along to receive some archery coaching at the Clyde Arrows Archery Club in Milngavie (pronounced 'Mill-Guy') I jumped at the chance to learn a new sport. The club meet at the privately-owned Milngavie and Bearden Sports Club on Auchinhowie Road in Milngavie. Travelling to Milngavie by train is easy as the train travels directly there with out changeover stops. The sports club is a short walk from the station and took about 7 minutes. As I was walking down the drive to the club house I saw Nicola, who introduced me to the other archers who were there. Nicola's husband, Simon, was going to be coaching me and he went through the commands to be obeyed when on the course. A siren sounds once to tell the archers they can fire their arrows and three blasts tells them they can walk to the targets to retrieve their arrows. The torrential rain of the previous 24 hours had stopped and had been replaced with bright sunny weather, so the session was held outdoors. After being given my bow, arrows, a bag for holding the arrows (called a quiver) and some leather protective gear, I was ready to start learning the basics of archery. Simon was a very good teacher and went through the basics and also taught me the safety advice. 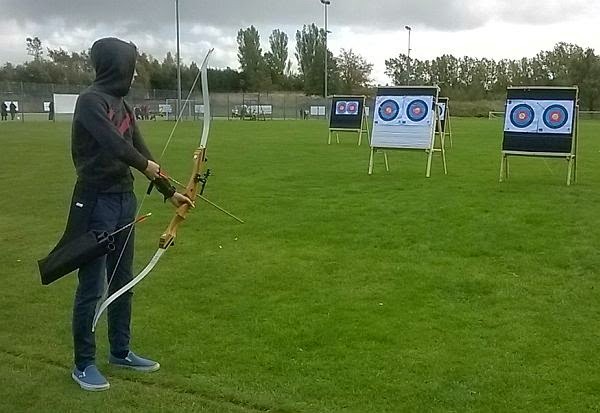 Archery is a sport which can cause injury so safety on the course is very important. 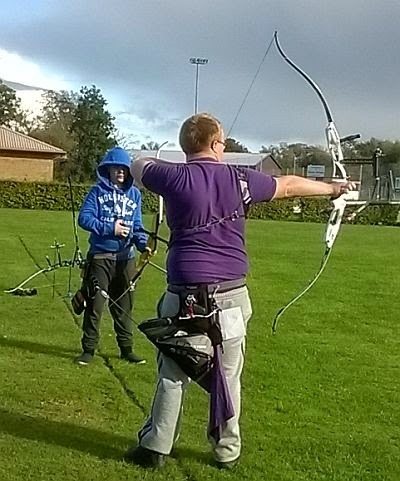 The bow I was using is called a recurve bow because of the curves at both ends. 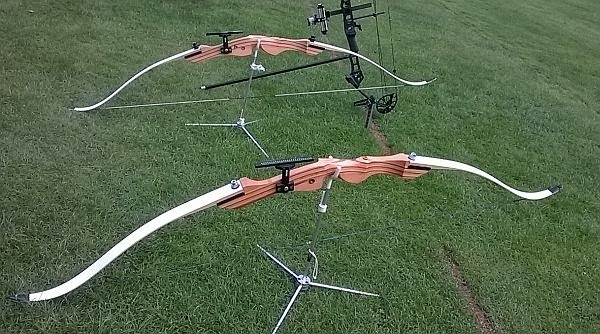 The bow sits in a stand when not in use to prevent damage to it. I had four arrows to shoot before waiting for the siren to sound to give the all clear to collect them again. I had a great time learning how to use a bow and look forward to my next lesson.